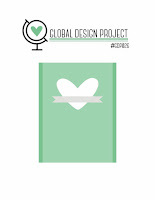 This is my entry for this week's Global Design Project, which is a sketch challenge. This is a very restrained card for me! 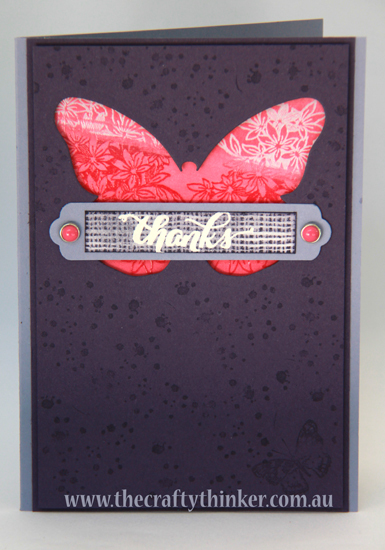 The top layer of Elegant Eggplant cardstock is popped up on dimensionals and is stamped with Versamark. The butterfly was cut out using a Bold Butterflies Framelit to reveal the pink panel below. To create the "pink panel", I did a watercolour wash on Whisper White cardstock using Rose Red and Wisteria Wonder inks. I then clear heat embossed the floral stamp from Awesomely Artistic before washing away some of the ink. I then added a very light Rose Red wash over the top to highlight the Wisteria Wonder portion of the stamping. I created the tag by clear heat embossing the greeting onto Whisper White cardstock before stamping over it with the hessian pattern from the Awesomely Artistic stamp set in Elegant Eggplant. I sponged on some Wisteria Wonder ink and edged the piece with Elegant Eggplant. I cut a slightly wider strip of Wisteria Wonder cardstock and used one of the Lots of Labels framelits to shape the ends (one end at a time). The finishing touch was to place some pink dots from the It's My Party Enamel Dots pack onto Candy Dot Brad Bases. If you would like to make a purchase, just click on one of the product images below.